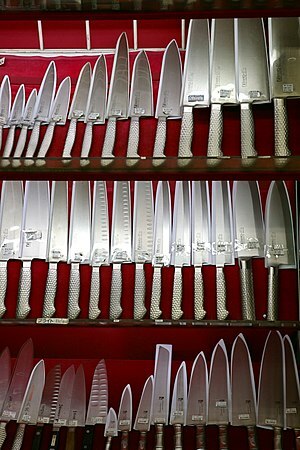 Modern steel used in knives is very high quality; the spine is the softest, toughest steel possible while the edge is extremely hard. Modern understanding has produced extremely hard edges that if treated right by the user will not dull for months after a sharpening. However, many people nowadays are so careless they will dull the knives in the same week they buy it. Almost all of these people do not have devices or people who can sharpen it for them, so they are stuck with knives that separate food with pressure and not cutting. Before I begin with the tips, lets see why a sharp knife is better than a dull one. 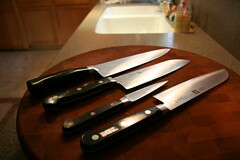 Many of you have knives that are as dull as a butter knife, yet they will still “cut” through vegetables and fruit. 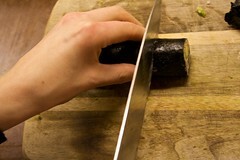 These knives separate the pieces you want through pressure, squishing the vegetable to the side at the pressure point. This basically tears up the inside of the fruit or vegetable, which is bad for three reasons. One, it’s kinda ugly. Two, the blade needs lots of vegetable under it to squish the fruit/vegetable down and out of the way, which means that once you get to the skin or peel, which is tough and not squishable, and eventually you have to tear the two pieces apart, which gives the peel a “jagged edge”. Very ugly and unprofessional. Three, a fruit or vegetable is made up of a few cells with juice or water in each one. The crunching sound when you eat an apple is these cells popping. When cutting a fruit or vegetable with a sharp knife, the edge only slices through the cells directly in front of the knife’s path, which means minimal juices wash out onto the surface of the fruit or vegetable. With a dull knife, as I said before the edge squishes through the fruit, tearing up all the cells anywhere near it, which washes tons of juice all over the fruit causing it to go bad much faster. An example of this effect: http://www.youtube.com/watch?v=Dr17wI64BBw . Another reason, of course, is you can get the job done many times faster with a sharp knife rather than a dull one. Which means a knife edge should NEVER touch glasses, plates, sink edges, measuring glasses or mugs. Remember, a sharp knife is a knife with the thinnest edge possible. Even barely touching this delicate edge against one of the abovementioned will destroy the edge, resulting in a dull knife. This is why you must ALWAYS use a cutting board. Do not cut on plates or hard surfaces like that. Now all you need to do is take precautions that the knife does not come in contact with these things. This means store it in a place where the knife is not laying on others, keeping it away from porcelain containers, etc. Now go, and stay sharp. This entry was posted in Uncategorized on August 28, 2013 by Captain Belaq. A Rifle is a long-barreled firearm with rifling inside the bore (hole) of the barrel. 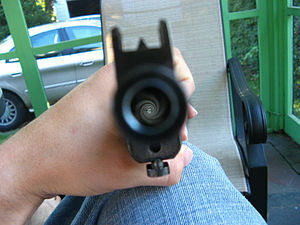 Rifling is the spiral design carved into the inside of the bore, which is designed to spin the bullet as it flies from the gun, which keeps it straight during flight and in turn promotes both accuracy and range. The steel used for the barrel must be very hard, so the rifling does not wear down under the bullet sliding through at more than 900 miles an hour. 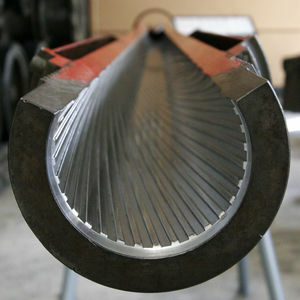 However, the whole barrel must be carved from Tungsten bits, and the harder the steel, the faster the bits wear down, which both wastes bits as well as the fact it takes longer to machine the steel. The steel most commonly used is numbered 4140. This is 1% Chromium, .4% Carbon, .25 % Molybdenum, 1% Manganese, and about .2% Silicon. This combination makes the steel fairly hard (not hard enough for knives though), hard enough to stay durable without rubbing to bits with every shot, yet soft enough not to lose the manufacturers thousands of dollars in bits. 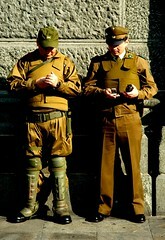 For many military rifles, a similar steel, 4150, has started to be adopted. This is exactly the same as 4140, except 4150 has about .5% more carbon than 4140. This .5% makes the steel much harder, which is vital for the military as full-auto guns wear through the rifling pretty quick. After a couple of battles, soldiers’ shots would begin to be less accurate and have less range, which is not good, obviously. The army is willing to pay for the more expensive (due to the time and bits that are used up in the factory) steel for more durable guns. This entry was posted in Uncategorized on August 21, 2013 by Captain Belaq. As a few of you know, I’ve been working a lot on ideas and forge designs, and have built three or four so far. 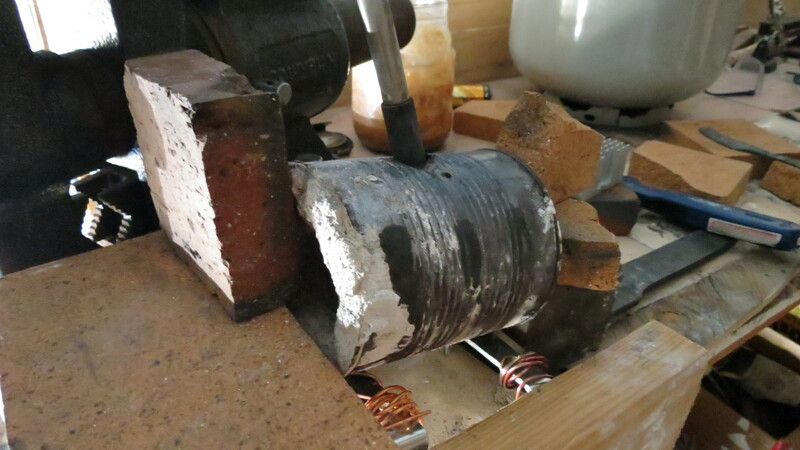 The biggest obstacle so far has been getting enough heat, but to keep that heat IN the forge, not on the wood around it. 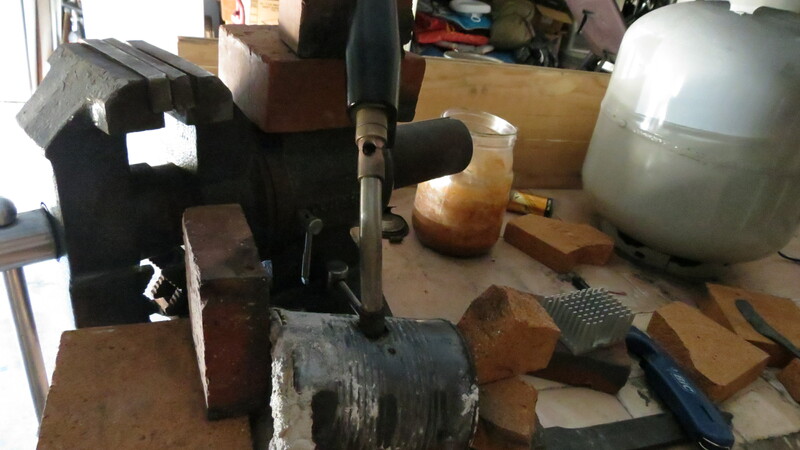 I’ve built a coal forge, stacked around bricks with a propane torch at an angle, housed stacked bricks in a steel barrel, and finally a forge made from an old soup can. After having to dismantle the barrel forge because of fire risks, I did research to find a better way of containing the heat. My research turned up this video, https://www.youtube.com/watch?v=jBVa2bw3r_k , and so I began building according to the general how-to shown in the video, with a few tweaks of my own. I found an old soup can in the garage, and, after drilling holes through the side, attached it to two steel L-strips. I then mixed a 50-50 mixture of plaster of paris and sand (the sand keeps the plaster from cracking under the heat), smoothed it out onto the inside of the can, narrowing the cavity at the two ends. I then drilled a hole at the top so I could insert the tip of a propane torch, and drilled the L-strips to the end of the workbench, where I put several pieces of tile to shield the wood from the heat. 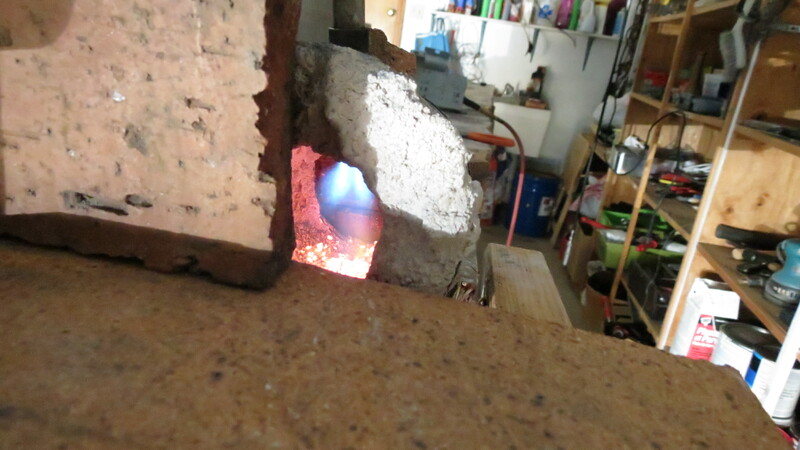 The first firing-up of the forge dried out the plaster, so I didn’t have to wait for it to dry. I hate waiting. All I have to do to fire it up is insert the tip of the torch into the hole at the top, and light the propane. The heat is conserved in the small cavity, and I usually stack firebricks around the holes to keep even more heat in. This thing really gets hot! This entry was posted in Uncategorized on August 16, 2013 by Captain Belaq.